The big purchase by Canadian NAT REA in the ring – she’s a very calm young lady that’s for sure! The STREET SENSE filly price is the second-highest ever paid for a yearling at the January Sale, ranking just behind the $3.4 million bid in 1998 for the filly Inkling. 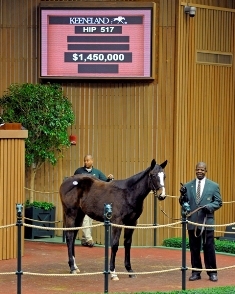 The top price for a yearling colt is $1.15 million spent for Videographic, also sold in January 1998. Out of stakes-winner Please Sign In, by Doc’s Leader, the filly is a half-sister to Shadwell Fillies’ Mile (G1) winner Certify and Oak Leaf Stakes (G1) winner Cry and Catch Me, and from the family of such champions as English champion Habitat, European champion Suave Dancer, Italian champion Suave Tern and German champion Shicklah. **KEENELAND JANUARY is off and storming and there were a few Canadians in action at the sale in the first 2 days. ANDERSON FARMS, JAMES PERRON RACING STABLE, BAR NONE RANCH and ADENA SPRINGS were buying horses as was the aforemetioned REA. Read more below about REGIS FARMS’ , which has been on a shopping spree since last fall. Richard Hogan is the farm’s advisor. For more than 130 years, Woodbine Entertainment Group has been part of the fabric of life in Toronto. Now, we’re calling upon our thousands of horse racing fans, patrons and community partners to take part in the City of Toronto’s casino consultations – and let city council know that you support the long-term future of Woodbine Racetrack, by supporting it as a casino location in Toronto. This month, the City is conducting a consultation process to gather the public’s views and opinions on possible locations for a casino in Toronto. Among them is Woodbine Racetrack in northwest Toronto – in the OLG’s C2 gaming zone, which is separate from the C1 zone where any potential downtown casino would be located. Why Woodbine? For one, it’s an established site for successful gaming; in fact, with its current slots facilities, it’s already home to the largest gaming operation in the province. One with plenty of room to grow its facilities in northwest Toronto. But there’s more to Woodbine than a world-class entertainment complex. It’s also a major creator of jobs – 7,500 in Toronto alone – and a pillar of the Ontario horse racing and breeding industry, which employs more than 55,000 people. Woodbine is a valued partner in the city, one that works closely with law enforcement and Toronto community organizations for decades to ensure safe, responsible gaming. Woodbine gives back to the community – millions of dollars to local charities and causes to help make Toronto a better place to live; millions more to government in revenue sharing and taxes. Now, Woodbine needs your help. A casino at Woodbine – with expanded gaming facilities including slots and table games – will ensure thousands of Torontonians will have secure and meaningful work for years to come. It will let Woodbine continue to support communities throughout the province, where horse racing and breeding are a vital part of the local economy. And it will preserve and grow one of Toronto’s most dynamic and valued entertainment venues – one that has been contributing to the life of the city from its current location since 1956. The City of Toronto has announced the details of its public Toronto Casino Consultation strategy. For the month of January 2013, the public will be invited to share their views and opinions on a casino in the City. The consultation process will gather input, including the public’s views and opinions on a casino and possible locations for Council’sconsideration when making a decision on this matter. City staff will write a report on the results of the consultation, which will go back to the Executive Committee in March. As a customer, as a community partner, as an employee or as a racing fan, you know what Woodbine means to Toronto – and what a casino at Woodbine will mean for Toronto’s future. The City has scheduled 5 community open houses which begin this week. Attend a public meeting or support a casino at Woodbine through the City’s online feedback form, available by clicking on the “Have Your Say” link at www.toronto.ca/casinoconsultation before January 25, 2013. It was an all Canadian story for the top short yearling sold at Keeneland on the first day of the January sale yesterday. An Ontario bred chestnut colt by Distorted Humor – Endless Journey, by A. P. Indy sold for $300,000 through Bernard McCormack’s Cara Bloodstock, for Ontario breeder Christine Hayden, from Lucan, to new local owner/breeder Nat Rea. The colt is the first foal of Endless Journey, who was unplaced in one start. The 2nd dam is graded stakes placed Steady Cat, the dam of Grade 2 stakes winner JUMP START. The 4th dam is Hopespringsternal, by Buckpasser. The colt was bought in utero by Hayden for $380,000 from the 2011 Keeneland November sale. Hayden has bred several good runners in recent years including last year’s useful 3yo Big Creek, plus King of England and multiple 2yo winner Royal Slam. Rea’s Regis Farm is based in King City, Ontario. He also recently purchased Silver Spring Farm in Paris, Kentucky. Into the home stretch: Ontario’s lottery corporation plans to pull slot machines out of most horseracing tracks this year, a decision the industry says would doom standardbred and thoroughbred racing and eliminate 30,000 jobs across the province. LOUISA TAYLOR examines the debate. Champion 2yo MARITIMER, a Canadian star 2 years ago, is headed back to Dubai, this time with trainer SET BENZEL and will try to get some of that big purchase price back in upcoming events. The colt, sold for a pile of cash last year to Ramzan Kadryov by Howard Walton of Ontario, has been unplaced in 2 races since he was bought. He is one of a handful of horses Benzel is taking to Dubai, his first trip to that side of the world. ROCKY ROMANO (Rockport Harbor), bred by Devonleigh Farm, won a strater allowance at Parx Racing yesterday for trainer Todd Beattie. I just read that Casa Loma died yesterday in a farm accident. Very sad if it’s true, she was a gritty race filly. What about the 30,000,00 horses jobs that provide 30,000,00 jobs? These horses are just being disposed to slaughter. The government has no interest in stopping the disposal of these horses, so why would they care about supporting racetracks PERIOD! The answer is simple, just dispose of the whole industry! COWARDS!! Hi Jen, I’ve filled in the online form regarding the Casino and I urge everyone else to take the 5 mins to do the same. This decision could have a HUGE impact on horse racing in Ontario and we need to be heard!